This award-winning book uses the letters of the alphabet to help young and old see the many, simple ways that they can fill buckets and fill their own buckets in return. When you help children become bucket fillers, you give them the key to happiness...for it is in friendship, love, and goodwill to others that we are truly happy. Yes, bucket filling is the moment by moment choice to be kind and caring. Teaching and encouraging children to be bucket fillers is one of the greatest gifts you can give to them. 32 pages | 8.50" x 10.98"
Imagination, dreams and motivation are key elements of young children's happiness and health. Thinking about goals, possibilities, and the future can help children cope with challenges when they arise and view life through a hopeful lens. With this cheerful and optimistic book, nurture children's imaginations as you encourage them to think about the future and focus on goals. That matter to them. At the same time help little ones appreciate and feel grateful with what they already have, and do their part to help other people feel happy and hopeful as well. Meant for reading aloud Dream On! includes a special section for adults, featuring discussion questions, activities, games and tips that reinforce the lessons from this book. 40 pages | 11.61" x 8.98"
Now that his Mishoomis, his grandfather, is gone, a young man remembers walking with him in the bush and listening to stories of the old days; he remembers being honored with an eagle feather at the powwow and not knowing what he had done to deserve this honor; he remembers his grandfather telling him that I had achieved a good deed from the first day he held me, as a baby, in his arms. Through his grandfather's gentle teachings a young Ojibwe boy learns the values of life and the significance of the eagle feather. Plains illustrations perfectly complement this deep little story and express the many layers of life's experiences. 24 pages | 9.00" x 8.00"
Fill a Bucket is the perfect gift for anyone with little ones they love. When children have their buckets filled and learn how they can fill other people's buckets too, they understand how special, valuable, and capable they are. 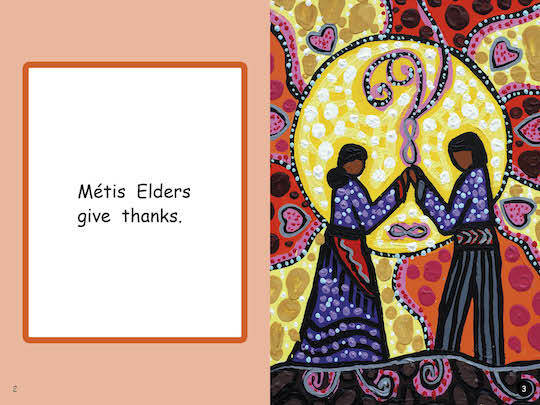 24 pages | 6.97" x 6.97"
For as long as anyone can remember, Mohawk parents have taught their children to start each day by giving thanks to Mother Earth. Also known as the Thanksgiving Address, this good morning message is based on the belief that the natural world is a precious and rare gift. The whole universe — from the highest stars to the tiniest blade of grass — is addressed as one great family. Now readers of all ages can share in this tribute to the environment, adapted especially for children by Chief Jake Swamp, whose efforts to share this vision of thanksgiving take him all over the world. Chief Swamp's inspirational message, along with Erwin Printup, Jr.'s unforgettable landscapes, make Giving Thanks a timeless celebration of the spirit of nature. 24 pages | 7.46" x 11.01"
Did you know that you have an invisible bucket which is filled with all of your good thoughts and feeling? If you are new to the concept of bucket filling and bucket dipping, then this book is for you. With easy to read chapters, colorful illustrations, a quiz and even instructions to make your own Bucketfilling Journal, Growing Up with a Bucket Full of Happiness will give readers the tools to live a life filled with happiness. 88 pages | 6.77" x 8.62"
Through sweet, simple prose and vivid illustrations, this heartwarming book encourages positive behaviour as children see how very easy and rewarding it is to express kindness, appreciation and love on a daily basis. This wonderful book is a winner of seven awards. From the highly acclaimed team of Byrd Baylor and PeterParnall comes the story of a girl who shares her love for desert life as she tells of treasured experiences like dancing in the wind on Dust Devil Day or sleeping outside on a hot summer night during The Time of the Falling Stars. Baylor's radiant prose-poem and Parnall's exquisite illustrations combine to create a joyous celebration of the human spirit. 32 pages | 8.00" x 10.00"
The sun on your face. The smell of warm bannock baking in the oven. Holding the hand of someone you love. What fills your heart with happiness? This beautiful board book, with illustrations from celebrated artist Julie Flett, serves as a reminder for little ones and adults alike to reflect on and cherish the moments in life that bring us joy. International speaker and award-winning author Monique Gray Smith wrote My Heart Fills with Happiness to support the wellness of Indigenous children and families, and to encourage young children to reflect on what makes them happy. 24 pages | 7.00" x 7.00"
The sun on your face. The smell of warm bannock baking in the oven. Holding the hand of someone you love. What fills your heart with happiness? This beautiful book, with illustrations from celebrated artist Julie Flett, serves as a reminder for little ones and adults alike to reflect on and cherish the moments in life that bring us joy. This paperback book is a dual-language (English and Plains Cree) edition of the board book My Heart Fills With Happiness. Recommended for Grades K-2 for the following subject areas: English Language Arts, Indigenous Language, Social Studies. 24 pages | 7.00" x 7.00" | Translated by Mary Collins. Even very young children can participate in service learning projects to help make the world a better place. This book begins with the concept of gratitude, because feeling grateful is a powerful motivator. Words and pictures show children contributing to their community in simple yet meaningful ways. Includes discussion questions, generosity games, and ideas for service projects. This book is part of the Learning to Get Along Series, which helps children learn, understand, and practice basic social and emotional skills. Real-life scenarios, lots of diversity, and captivating illustrations make these read-aloud books perfect for home and childcare settings, as well as schools and special education settings. Each book ends with a section of discussion questions, games, and activities adults can use to reinforce what children have learned. 40 pages | 7.67" x 9.17"